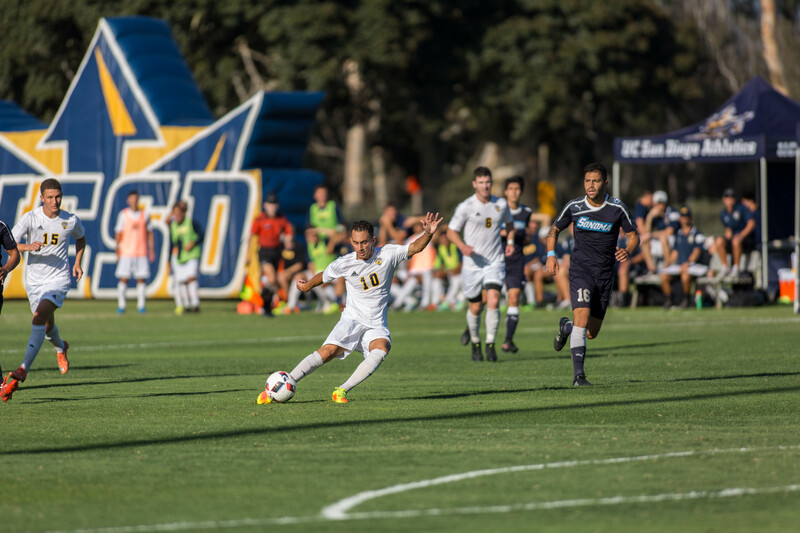 Even away from home, the UCSD men’s soccer team dominated Cal State East Bay 3–0 this past Sunday, Oct. 21. With this win, UCSD clinched its fourth consecutive California Collegiate Athletic Association berth, and the team remains in first place in the league table. This is also the Tritons’ seventh straight win, and they are now 8–1–1 in the CCAA and 13–1–2 overall. Cal State East Bay fell to 2–6–2 in the CCAA and 6–8–2 overall. Entering the weekend, UCSD was the nation’s No. 1 side statistically with a 0.27 team goals-against average. By the end of the road trip, it improved to 0.30. The Tritons wasted no time in showing up their competition, as they scored their first goal in the third minute. UCSD earned a free kick due to a foul, and senior midfielder Justice Duerksen threw in the ball to fellow senior midfielder Riley Harbour. Redshirt junior forward Malek Bashti received the ball from Harbour in the middle and kicked it toward the left side of the goal. This marked Bashti’s second goal of the season, both on the road, and Duerksen and Harbour’s third and first credited assists, respectively. Another goal didn’t come until the 34th minute due to a foul against sophomore forward Nathaniel Bloom. Senior midfielder Nick Palano took the free kick and launched the ball toward the left side of the goal, scoring the second goal of the game despite a trying dive by the Pioneers’ freshman goalkeeper Carlos Moreno. Moreno did redeem himself a bit, though, right before the end of the first half. Earning his only save of the game, he saved a corner kick from Bloom on the right diagonal. The Tritons put the nail in the coffin in the 70th minute with their third and final goal of the game. Junior forward Uly de la Cal launched a free kick far down the left flank toward Harbour. Harbour then kicked it over Moreno’s head toward the right side of the goal, earning his fourth goal of the season and his first road goal of the season. This was de la Cal’s fifth assist. The Tritons outshot the Pioneers 16–1, leaving Triton redshirt senior goalkeeper Cameron McElfresh to chill in the frame. McElfresh didn’t even need to make any saves, as the only attempted shot by the Pioneers was not on frame. UCSD is on the road again this week, playing Cal State San Bernardino today at 12:30 p.m.